First sees reality.” – Wallace Stevens Esthétique du Mal. Loneliness is drug. Powerful. Hallucinatory. Its psychoactive effects can lead you to underestimate the consequences of venturing into uncharted territory. To a place you don't belong. A place fraught with danger. “There” not “Here”. Outside. Through the hole in the fence. Into the woods. But we are not built to be alone. The solitary man is no man at all. A life of quiet contemplation is no life really. Being alive requires us to step forth into the world of others. Shared experiences are more real somehow. When I was 21, I made a road trip from New York to Texas. Along the way I stopped in Memphis and took the tour of Graceland. As I wandered around Elvis' mansion, my sense of self began to bend in ways it had never bent before. By the time I made it to the Jungle Room, my brain was so filled with an internal dialogue composed of a thick, viscous gibberish that I began to eye all the exit routes, convinced that I would need to flee before it got any worse. If only I had someone I could trust next to me, someone to whom I could have whispered, “Can you believe this?” I could have made sense of the experience, I could have reveled in the weirdness. Alone, I was bent. With a buddy, I would have been King. Nobrow Press has just recently published Jen Lee's Vacancy as part of their 17x23 series, and this beautiful book has me thinking about solitude and experience. It's these ideas that provide the backdrop for an amazingly dense story told through character and inference. In Lee's telling, though, there is a larger background to this seemingly “grass is always greener” story that has to do with anthropomorphic animals, crashed planes, destroyed spaces, quarantine areas, and questions like “Don't you remember what happened to Randall?” Much like her webcomic, Thunderpaw, there is this sense that something apocalyptic has happened, leaving the animals changed, leaving them to fend for themselves, leaving them unsure of what the rules are now. And, like in Thunderpaw, Vacancy revolves around the need for companionship in navigating this new world. It's a beautiful book both in terms of its storytelling and well as its craft. Lee's use of color is breathtaking, especially her use of sunset and sunrise soft reds and pinks to capture atmosphere, tone, and mood, especially when juxtaposed with the blue-greens of her nights and the momentary stark, flat white of her days. In the 24 pages of Vacancy, things crackle when they should, quiet when you need to hear the whispers, and bleed when something is after you. 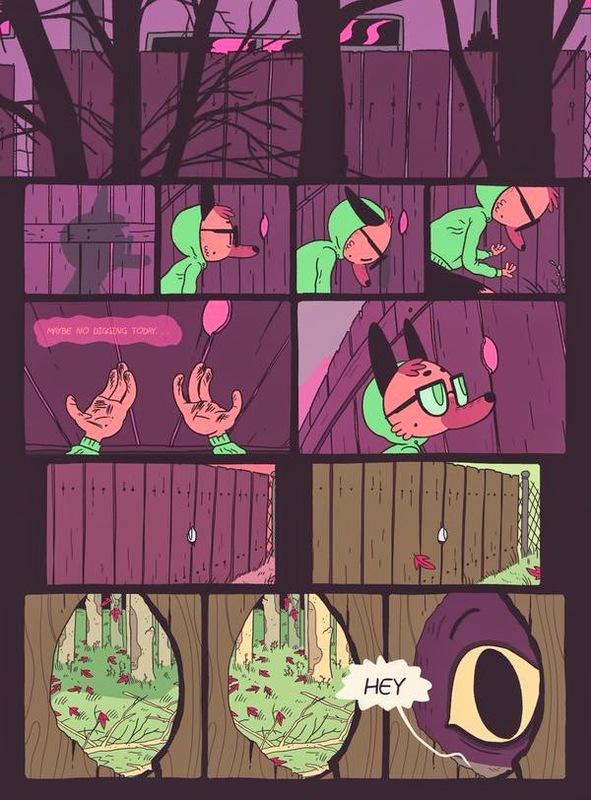 Lee's cartooning seduces you into one set of emotions – comfortable and familiar in a Saturday Morning sort of way – while the story itself murmurs something strange off to the side, almost hidden in the forest. 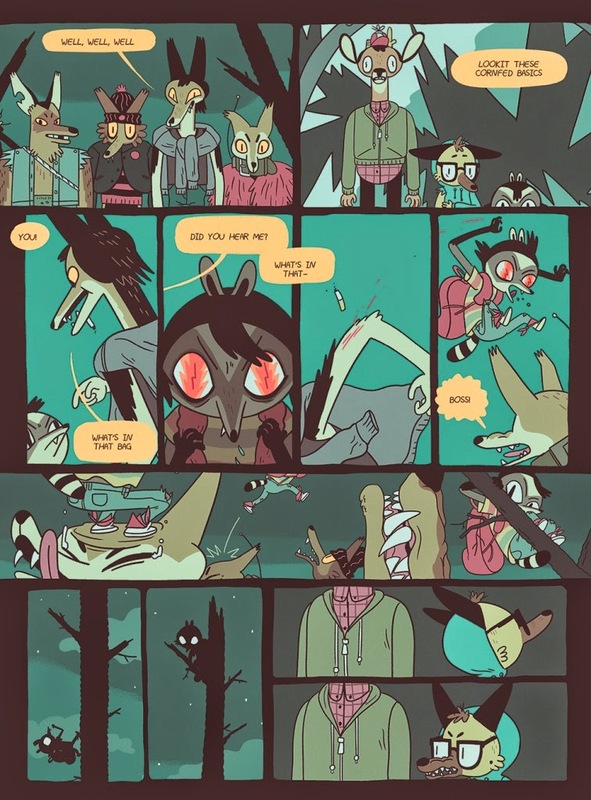 Lee's main character is hoodie wearing, bespectacled dog. Simon cannot function in isolation. Upon hearing howls from the woods outside his fenced yard, he dreams of marking “trees with you soon, my yote brothers.” But he just doesn't have the capacity or the wherewithal to venture forth alone from his enclosure, his home. He takes the random opportunity of strangers in his midst to step out into a new world; he needs guides to show him the ropes of this adventure. But his pathfinders are seemingly little help when it comes to navigating the dangers of the woods. Rather, as the monomyth trope demands, they teach him the value of something more meaningful, the powerful sense-making systems of community, the understanding that we are all that much more capable when we stand together as one. Lee's world-building is as dynamic a character as her anthropomorphic heroes. As her trio journeys, the environment they discover and cross through develops and, in doing so, tells a secondary story of destruction and despair. Through inference, reading the signposts that Lee has put up in this world, the audience begins to glean what may have happened to Simon's family and why these animals dress and behave as they do. And it is in these conjectures that the reader begins to unfurl a terrible backstory that they, themselves, own. Which gives this comic its heft and its power. Which serves as a dialogue between artist and viewer. Which makes the reading of Vacancy such a pleasure and provides a small communal event therein. 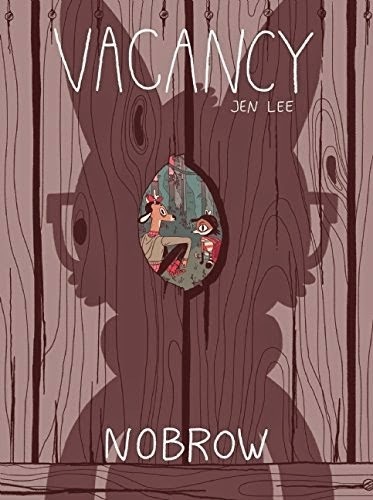 You can purchase a copy of Vacancy from Nobrow Press directly by clicking here.